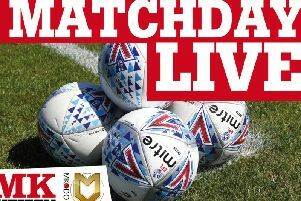 MK Dons boss Robbie Neilson was delighted the spirit and character of his side after they twice came from behind to secure a 2-2 draw at Charlton Athletic on Saturday. And the Scotsman reserved special praise for striker Kieran Agard, who came off the bench to score twice, holding his nerve to slam hom the stoppage time penalty that secured a precious point for the Dons at the Valley. Charlton had taken an early lead through a Josh Magennis header, but second-half substitute Agard cancelled that out on 63 minutes with an excellent header of his own. The home side looked to have won the game thanks to Scott Golbourne’s unfortunate own goal three minutes from time, but Agard kept his composure to score from the spot after Peter Pawlett was tripped in the penalty area. “It’s a good point for us after going behind twice, and the nature of the second goal and the timing of it,” said Neilson. “The team showed a lot of spirit to get a point. “All three subs that came on changed the game for us, and the big thing was they made an impact and gave us energy. The goals were Agard’s first of the season, and Neilson said: “I was delighted for him, he had the guts to go up there and take the penalty. “He’s not had a great start to the season with his goalscoring, and we had a good chat with him earlier in the week. “Stevie (Crawford) did some work on him, telling to make sure you keep getting in there and working hard, because if you put the effort in and make the right runs, your results will come. The point from the trip to Charlton means MK Dons are in 13th place in Sky Bet League One ahead of Tuesday night’s home date with Southend United at Stadium MK. The Dons are just five points off the play-off places, and the Scotsman said: “It is a quick turnaround, and this week is massive for us. “We have played Charlton away, then we have Southend at home and Doncaster away, and they are three good teams.